Spring Service Package | Hindson Marina Inc. Prepare for a safe and enjoyable boating season. Regular Spring maintenance increases the life of your engine and ensures trouble free boating throughout the summer. Spring is time to tune up your engines, check your anodes and impellers for wear, change your fuel filters, and give your boat and engine a good overall check up. Inquire at our Service Department to receive a custom tailored maintenance program for your boat. 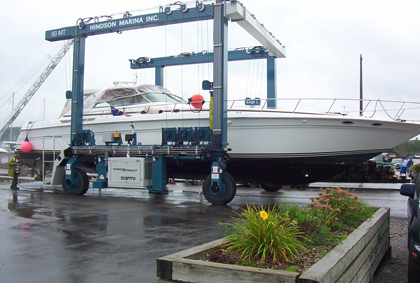 At Hindson Marina, we have experienced staff to promptly and professionally take care of all your Spring Launch needs. From removing your shrink wrap to commissioning your vessel, we have you covered. Just fill out the two page on-line Spring Launch and Service Form and send it back to us. Our fully trained staff will take care of all your service needs and have your boat ready for the upcoming season.